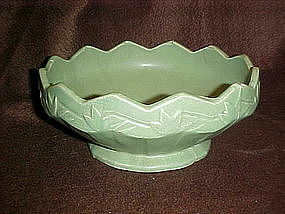 Nice old planter bowl measures 8 1/2" in diameter and is 3 1/2" tall. No mark on the bottom as most of the old Nelson McCoy pieces aren't marked. No chips cracks or crazing. Nice deco tulip pattern repeats around the ric- rac edge. Underglaze imperfections on the bottom. A really nice matte green finish. Concentric raised rings inside the bottom.